In Photoshop Elements, you may need to flatten your images or merge layers. Flattening an image combines all visible layers into a background, including type, shape, fill, and adjustment layers. Merging layers combines visible, linked, or adjacent layers into a single layer (not a background), which saves memory and space. The intersection of all transparent areas is retained. The only file formats that support layers are native Photoshop (.psd); Tagged Image File Format, or TIFF (.tif); and Portable Document Format, or PDF (.pdf). If you save your file in any other format, Elements automatically flattens your layers into a background. If you need to import your file into another program, certain programs don’t support files with layers. Therefore, you may need to flatten your file before importing it. You’re prompted as to whether you want to discard hidden layers, and any transparent areas are filled with white. Before you flatten your image, make a copy of the file with all its layers intact and save it as a native Photoshop file. That way, if you ever need to make any edits, you have the added flexibility of having your layers. Make certain that all layers you want to retain are visible. If you have any hidden layers, Elements asks you whether you want to discard those hidden layers. 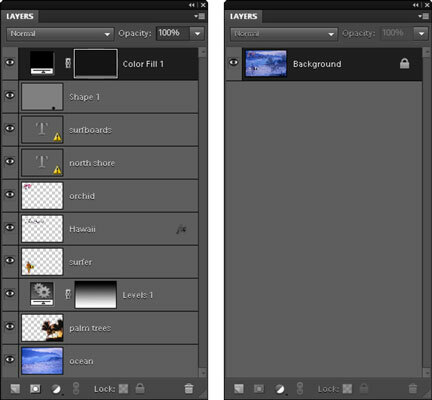 Choose Flatten Image from the Layers panel menu or the Layer menu. All layers are combined into a single background. If you mistakenly flatten your image, choose Edit→Undo or use the Undo History panel. Flattening combines all your layers into a single background. Select only those layers you want to merge. Choose Merge Layers from the Layers panel menu or the Layer menu. Display only those layers you want to merge. Click the eye icon on the Layers panel to hide those layers you don’t want to merge. Choose Merge Visible from the Layers panel menu or the Layer menu. Arrange the layers you want to merge so that they’re adjacent to each other on the Layers panel. Select the topmost layer of that group and choose Merge Down from the Layers panel menu or the Layer menu. Note that Merge Down merges your active layer with the layer directly below it.